The 1509 Series electromagnetic door holder is a low profile, high quality device for use with single doors. The electromagnet assembly is designed for flush wall mounting. The electromagnet is designed to be flush wall mounted inside a standard single gang outlet box (not supplied). Field wiring connections are made to the electromagnet inside the electrical box. The catch plate assembly may be mounted to the door either by through-bolting or by using the concealed surface mounting plates. Designed to be used on self-closing, swinging doors to automatically isolate an area when activated by fire alarm, smoke detection or sprinkler systems. Can also be operated by manual control — wherever the instant closing of doors is necessitated for safety or for convenience. Hospitals — for stairwell doors, room doors, long corridors, schools — exit door (closes all doors at once by pushbutton control); offices (instant privacy by pushing a button on your desk), nursing homes and public buildings. 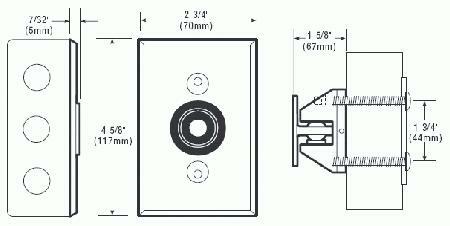 The 1509 Series door holder is an auxiliary device designed for wall mount applications that require holding single doors.